Poison ivy is a very prolific plant and can be found almost anywhere. It is common to see this plant along roadsides, along fence lines, in the woods, at forest edges, and even in the landscape. A reason for this wide distribution is that fruit is eaten by wildlife like birds and deer. It is documented that over 60 species of birds have fed upon poison ivy berries. The seeds are not digested, but move through the intestinal tract to be deposited wherever the bird flies and of course makes a deposit. Unlike humans, wildlife do not become sensitized to the oils, therefore not experiencing the itching and rash. 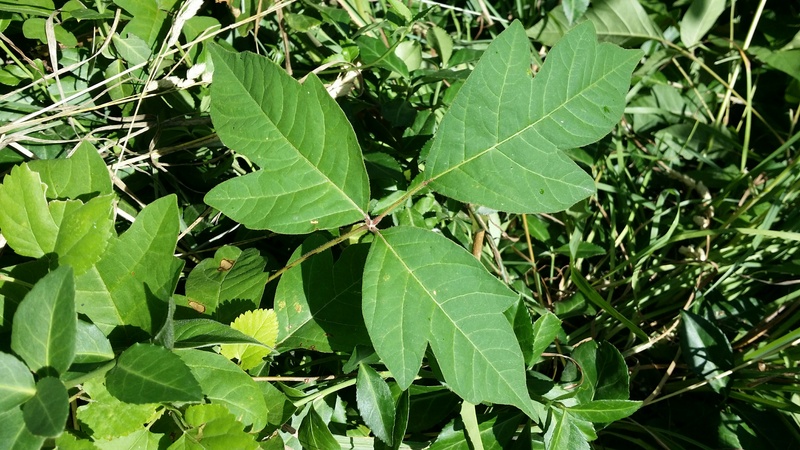 Poison ivy can sometimes be confused with some other common plants including Virginia creeper (Parthenocissus quinquefolia), boxelder (Acer negundo) and paperbark maple (Acer griseum). The leaves of poison ivy can be dull or shiny with margins that are toothed or wavy. Hairs can be present or absent. The leaf is compound, and has three leaflets and is arranged in an alternate pattern along the stem. The terminal leaflet is typically larger than the lateral leaflets. The leaflets are between 2 - 5 inches long. The leaves are green during the growing season, turning a beautiful red in the fall. The urushiol is easily transferred to clothing, skin, tools including pruners and shovels, and your pet's fur. These contaminated items can "spread" poison ivy without you having to come in direct contact with the plant in nature. Poison ivy should never be burned as the smoke from burning poison ivy contains the oil and can irritate lungs, nasal passages, skin and eyes.